You may have seen snippets of a Flow State Summit on your social media feed, if you are into total human optimization, you may have ventured to the website and perused through the beautiful pages: www.flowstatesummit.com a couple times, wondering if this event is a good one for you. Check out the official Flow State Summit Prep Course/ticket 50% off if you purchase by April 10th. Summer Huntington, founder of Clubbell Yoga and Flow State Summit. The Flow State Summit line up includes - Steel Mace with Leo Savage, Wim Hoff Breath workshops each day with Ricardo Broberg & Benjamin Pelton, Embody Love Movement with Minta Allred and much more - check out the entire line-up of workshop facilitators, circus performers and music acts here. Summer has been dreaming up this event for a couple of years now, and if finally came together after having a few phone meetings with Leo Savage. He is a huge inspiration for this event, in that he completely embodies flow with this Steel Mace Movement. 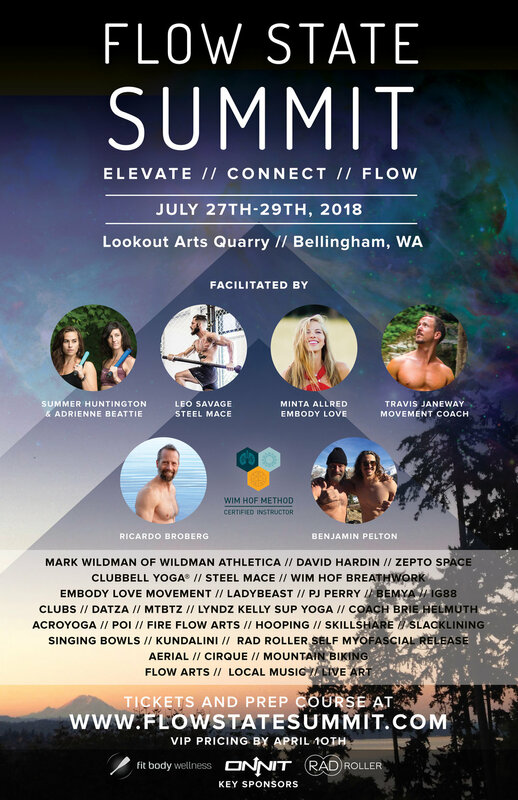 She started reaching out to her coaching community, people like Mark Wildman (Celebrity Trainer from LA), Brie Helmuth (Breakdancer & Coach from NYC), local instructors like Lyndz Kelly at Elements Hot Yoga, and the overwhelming positive response led her to move forward and curate this event. Leo Savage - ONNIT Steel Mace Specialist and flow artist. With a leadership team of over 45 individuals, this event is going to be one to remember. We plan to elevate, learn and Flow in workshops by day and dance and move to live music by night. Free community brunch included in the ticket price, we will be eating together both days on Saturday and Sunday morning and setting our personal intentions for the day. If you have been on the fence about whether or not you can make time for yourself, or invest the $299 (50% off valid until April 10th) for all inclusive camping and free community breakfast... I strongly encourage you to carve out the time and make it happen. Our vision is to create an environment where you can experience what it means to step into Flow. All levels welcome, and expect the friendliest most welcoming people at the Summit. Friendships will be made, energy exchanged, and Flow will be embodied. Are you in? Get your ticket/prep course early via Ambassador Summer Huntington's discount pricing (50% off until April 10th). Questions, use our contact form to get in touch. Big thank you to sponsors: Fit Body Wellness, Onnit, RAD Roller and Sheath Underwear for helping us get this first time event off the ground.